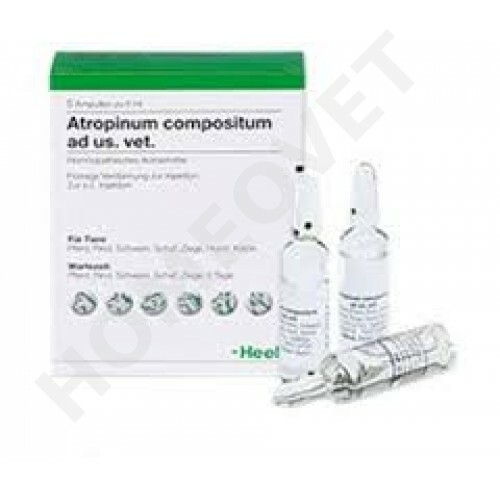 1 ampoule of 5.0 ml (= 5 g) contains: Atropinum sulfuricum D4 500 mg; Cuprum aceticum D4 100 mg; Citrullus colocynthis D4 100 mg; Veratrum album D4 100 mg; Acidum arsenicosum D6 100 mg; Lytta vesicatoria D6 100 mg; Bryonia D4 100 mg.
Spasms of smooth muscled hollow organs, gastrointestinal colic, renal colic, spastic cough. Hypersensitivity reactions (or even anaphylactic reactions) may occur in isolated instances on the i.v. administration of foreign proteins in a concentration higher than D10. In cases with acute symptoms, the indicated dosage can be repeated once after a period of 6 hours. Heel ampoules may be used for injection (subcutaneous, intramuscular or intravenous), taken orally or injected to acupuncture points, individually or can be combined with other Heel injection solutions. The normal dosage is 2 or 3 times a week, in severe cases daily, sometimes several times a day, if recommended by a Vet, until improvement. The advantages of an oral application of the ampoules, are convenience and lack of complications since the customer himself can do this. Homeovet Fenugreek for horses has an expectorant effect, rich in vitamins ABCE and calcium.